KATHMANDU, Nov 16: The National Reconstruction Authority (NRA) on Thursday decided to hand over the responsibility to the local bodies to develop the unified settlements containing at most 99 houses. A meeting of the NRA's executive committee decided to accept the Work Procedure for development of unified settlement, 2017, according to which the local bodies will receive the grants for the development of unified settlements containing up to 99 households. The grant, which is administered by the NRA will be provided to the local bodies through the District Project Implementation Units (DPIU). But unified settlements containing more than 100 households will be directly overseen by the DPIUs under the Ministry of Urban Development. 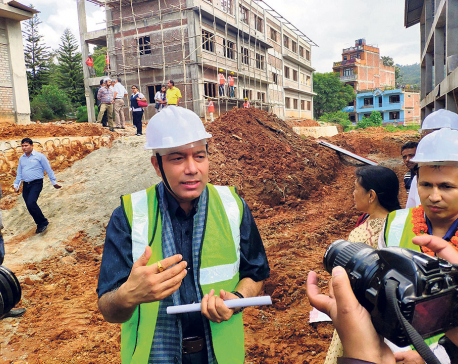 According to the Chief Executive Officer (CEO) of NRA Sushil Gyewali, the new provision will help in infrastructure development, settlement management, and in bringing together the families which were separated due to the earthquakes. The work procedure states that earthquake victim families will be given priority to live in the unified settlement. People who are not victims of the earthquakes can also live in the unified settlement, but they will not receive the reconstruction grant. The work procedure also mentions that unified settlements can be developed in a different location if the planned location is under high risk of earthquake due to the the geographical setup and the NRA will set up basic infrastructures in the new location. According to the work procedure, each household in the tarai region included in a unified settlement construction project will receive housing reconstruction grant of Rs 300,000, household in the hills will receive Rs 400,000 and from housholds in the mountain region will receive Rs 500,000 as reconstruction grant. BANEPA: People’s representatives in Kavrepalanchowk have blamed the technical team involved in verifying the housing construction for the delay in reconstruction in the district. Recently, a discussion was held between the chiefs of 13 locals units of the district and the chiefs of various authorities responsible for the reconstruction. The people’s representatives vented their ire against the technical team. Laxmi Narsingh Bade, the mayor of Banepa, accused the authorities involved in the reconstruction of not coordinating with the local units. “It’s been months since we wrote to the authority but we haven’t received a reply yet. The engineers deployed by those authorities do not listen to us,” he laments. Bhim Neupane, the mayor of Panauti, stated that no one is aware of how the engineers work or whether they work. As per the representatives, engineers, sub-engineers and assistant, sub-engineers will not work properly unless the local units are authorized to regulate their pay, perks and expenses. 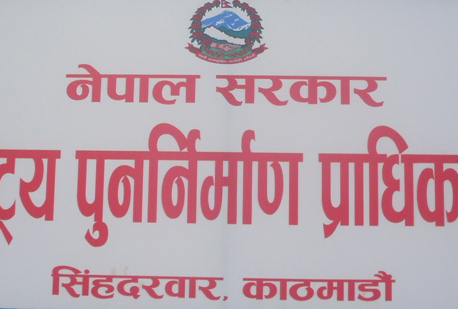 Chairperson of Chaurideurali Rural Municipality Dinanath Gautam informed that there are currently no technicians in his local unit. “So the reconstruction work remains halted in my local unit,” said Gautam. Meanwhile, Mahalaxmi Joshi, the chief of the District Project Implementation Unit (Urban Development), accused the people’s representatives of protecting the non-performing/under-performing engineers. “It’s the local units which sanction the salaries of the engineers stating they worked for 28 days even when many of them actually work for less than two days,” said Joshi. She urged the people’s representatives not to sanction the salaries if the engineers do not work regularly. Altogether 154 engineers have been deployed in six municipalities and seven rural municipalities of the district. Joshi informed that nine of them have left their jobs. Engineers are currently verifying documents for the second and final tranche of the reconstruction grant. Those verified documents are later submitted to the Grants Management and Local Infrastructure Unit (GMLIU). Then the GMLIU forwards the documents to Office of the Comptroller and finally, the grant is provided to the service seekers through the bank.